This Thai pea soup is made completely in the blender and full of fresh spring flavor. With ginger, lemongrass, coconut milk, jalapenos and peas, you’ll want a big bowl. This might be the first year there wasn’t a single blooming bulb or bush in sight on my birthday yesterday. Not one. The daffodils are about 3 inches tall, the daylilies about the same height and the forsythia aren’t even close to opening. So far, 2015, I’m not impressed with your spring. On the bright side, my mom and I did plant a flat of pansies which are a big improvement over the dead mums that have been hanging out in those 3 pots for the past 6 months and things like this Thai pea soup have been making their way into my kitchen because peas = spring. Obviously. 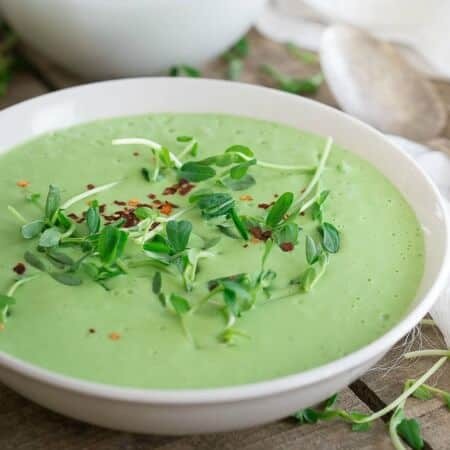 Besides tasting like spring in a bowl, the other cool thing about this soup is that it’s made completely in the blender and it can be served at any temperature you want, no need for it to be piping hot. I actually preferred it room temperature to cold the best. Brandy’s roasted cauliflower fennel leek soup is also made completely in the blender but that one tastes much better hot. Mine is spring in your face with bright greens and tangy lime, lemongrass and ginger. Hers is like the creamy comfort of winter meets spring vegetables. This Kick Sass Kitchen (<– hey, be cool and subscribe to our channel if you like these?) video had me standing on the counter, hitting my head multiple times on the ceiling and of course, more singing and dancing, this time to early 90s Salt ‘n Pepa. Because when you say “soup” ten gazillion times in a day your brain starts hearing “shoop” and then there’s just no choice but to belt out the lyrics to your favorite 6th grade song (ps- I still know every single word 22 years later). Looking for more blender soups? Try this potato pumpkin soup. Pumpkin isn’t just for October! This Thai pea soup is made completely in the blender and full of fresh spring flavor. With ginger, lemongrass, coconut milk, jalapenos and peas, you'll want a big bowl. Garnish with pea shoots and red pepper flakes. Soup can be served cold, room temperature or hot depending on preference. Always love these videos!! SO much fun. Wish I had some of this soup around for lunch today! Oh my gosh! That outtake video is the best thing I’ve seen today. I had a great laugh. Love it! And this soup = it’s just the most beautiful green hue. I’m obsessed! Amazing idea for a pea soup! I would have never thought of adding coconut milk and lemon grass — two of my favorite ingredients. Can’t wait to give this a try! You ladies crack me up. Love the outtakes video! Oh, and that song was the bomb back in the day. What a gorgeous spring soup. Pinned. Love blender soups and adore the videos! You ladies are too cute and too funny. Can I come hang out with you guys? 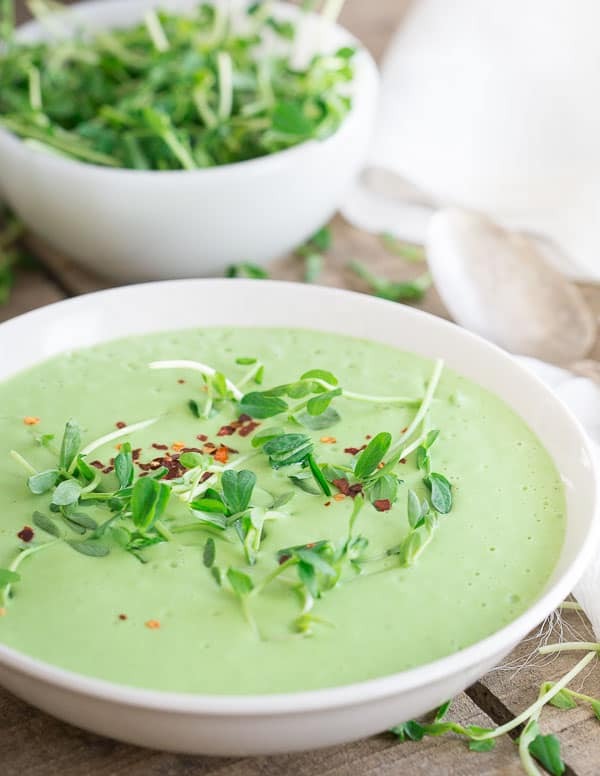 Bright green pea soup gets me every time, so pretty! I was feeling a bit under the weather this morning and decided I wanted soup for lunch. I had saved your recipe in a bookmark folder and happened to have all the ingredients available. I didn’t have lemongrass paste but I did have fresh lemongrass stalks so I used those instead. I made the soup in my Vitamix, then heated it gently on the stove. It was so flavourful and delicious that I’ll be making it again later this week. Thank you for sharing it. I’m thinking bout making this but for one thing I have a gag reflex with cilantro si I’m thinking of subbing Thai mint and/ or basil … also pea shoots are hard for me to find. Wondering if watercress will do? Haha, people definitely either love or hate cilantro! Thai basil would probably be great in its place. Watercress is a great garnish too, just much more distinct in taste but if you like it, go for it! This soup is DELICIOUS! And BEAUTIFUL! Thanks so much for a great recipe. Wonderfully simple! Sooo…tasty! Love that it can be a 4 season dish.